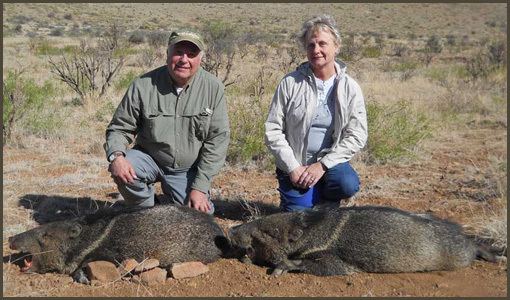 Javelinas are also known as the collared peccary, and provide an exciting hunt for rifle enthusiasts and archers alike. This species can be taken year round with a limit of two per hunter. The hunts occur throughout a number of private ranches with which we have exclusive hunting arrangements, so that maximum opportunities are provided to our hunters to acquire a large trophy animal. We guarantee these hunts and have a 100% success rate for our hunters. The terrain ranges from desert foothills to higher elevations featuring scattered cedar, pinion and pine forests.